Do you remember back in 2011 when a guy by the name of Warren Rodwell was abducted by Islamic extremists and held captive for ransom for 472 days? During this time there was a media blackout by both the Australian and Philippines government. On the night of 5th December 2011, Rodwell was supervising workers renovating his house where he lived in the Philippines when suddenly four armed men dressed as policemen confronted him with military weapons and kidnapped him. They thought him wealthy so it was a kidnap for ransom. During his ordeal one of the kidnappers shot him through the hand. Rodwell claims they were Islamic extremists and kidnapping was a profitable business. He was held in appalling conditions for 472 days. When he was finally released in March 2013 after a large ransom had been paid, his physical condition was extreme. He had lost a lot of body weight and was in severe poor health and suffered anxiety. However, this story is not about his kidnapping, rather it’s about his transforming and growing personally from his horrendous experience and his song that came out of it. Once home, he suffered with extreme depression and anxiety for a long time. He continuously felt numb, was in shock and reliving the threatening scenarios over and over again in his mind. He stared at the walls and moped around. Terrifying thoughts overwhelmed him. However, he slowly began to heal by writing all these thoughts down in the form of song lyrics. Therapists call this post-traumatic growth, and instead of going into full blown post-traumatic stress disorder, his traumatic ordeal allowed Rodwell the opportunity to grow personally from his horrendous experience and to tap into his muse allowing him to heal with his ability to express his self-creativity. Hence the Situation Not Normal song was born out of his ordeal. This gut-wrenching but almost danceable song outlines his suffering in a frank non-bitter way. It was composed and performed with an “Arab blend gangster rap feel” by techno Cowpunk band Mad Cowboy Disease, from the Blue Mountains in NSW, which has Josie Critter as their front man. The tune, lyrics, instruments, and of course Josie Critter’s deep voice really come across as a finely crafted dark, powerful, haunting yet rhythmic, blend, timed to perfection. Mad Cowboy Disease formed in 2007. Its six piece line-up consists of bass, lead, violin, polysynth, harmonica, digiphone, (like a sliding didgeridoo and is played like a trombone), with Patsy Inclined on keyboard. Having received widespread television and radio airplay as well as positive critical acclaim from the media, Mad Cowboy Disease have also released three albums in the form of One Trick Pony, Let Them Eat Road Kill and Frontier Veterinary Science. Their fourth album as yet untitled will feature Rodwell’s Situation Not Normal. It was through social media that Rodwell met Critter and they clicked immediately. He had already penned his lyrics but when he heard Critter’s deep voice in a particular song, he knew then that this was the voice he was looking for. When I chatted to Josie Critter he told me that they like to “take the piss” out of a situation and pen lyrics to it. Rodwell’s experience was out of the ordinary and it suited their music style very well. 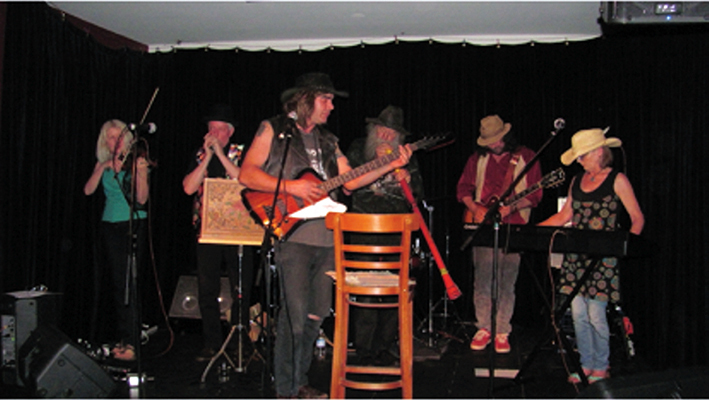 Mad Cowboy Disease will be gigging in Melbourne in January 2016 for the Epilepsy Awareness Concert. When all arrangements are finalised, concert details will be announced. Luckily for us Melburnians we will have the opportunity to hear the live debut version of Situation Not Normal while they are here.